Competitive cricket came to the Southern Highlands in March 1860 when a Berrima District team played in a cricket tournament at Goulburn. The following year on April 24th 1861 the Goulburn Herald reported the first formal local cricket match when Berrima and Goulburn met at Berrima. Southern Highlands cricket received its greatest boost in season 1884-85 when the Eighth English team (all professionals) led by Arthur Shrewsbury played a Berrima XXII at Moss Vale Agricultural Showground on 21 and 22, January 1885. A 1000 strong crowd witnessed the England team bat first scoring 432 runs. In reply the Berrima team were totally outclassed by the English bowlers, scoring a disappointing 14 runs. England teams subsequently also played in the district in 1887 and 1888. 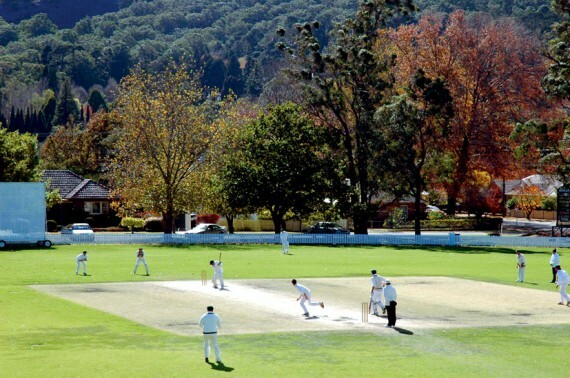 In 1894-95 the Surveyors Camp Cricket Club was formed and changed its name in 1905 to Bowral Cricket Club. Other local clubs of the day included East Kangaloon, Berrima, Wildes Meadow, Robertson, Moss Vale, Mittagong, Bundanoon, Sutton Forest and Joadja Creek. Bowral is well known for its association with Sir Donald Bradman who arrived with his family from the Cootamundra district aged just two years old. As a school-boy he played for Bowral Public School against Mittagong scoring 115 runs not out and taking 8 wickets. His captain asked him to retire on 72 runs in the return match. It was then asked by the captain of Mittagong to leave Bradman out of the team or they would forfeit the match. A keen sportsman Bradman excelled at local athletics, rugby league, tennis but firmed in his commitment to cricket as he matured. His local grade cricket career was unremarkable as a youngster. Commencing occasional matches as a 12 year old he would not make a century until he turned 17, striking a stupendous 234 runs against Wingello and against an unsuspecting Bill O’Reilly who would himself later become a legendary Test cricketer. After Bradman made a local record of 300 runs in one innings for Bowral Cricket Club later that same year his name attracted attention from the NSW cricket authorities. An invitation to play with the Sydney Grade Club St George, was accepted and the young batsman commenced an arduous trip to Sydney every Saturday to play. His achievements in this competition, his first played on grass pitches, saw Bradman selected for New South Wales in 1927-28 and thence Australia in 1928-29. Meanwhile Bowral Cricket Club has continued to be a leading club in the local competition and today fields junior and senior teams in the Southern Highlands competition. In recent times the club has actively promoted the game to girls.